Huntington Ingalls Inc., Pascagoula, Miss., is being awarded a $1,514,080,000 fixed-price-incentive modification to previously awarded contract (N00024-06-C-2222) for the procurement of the detail design and construction of Landing Platform Dock ship (LPD 27). It will incorporate the previously purchased long lead time material efforts and the necessary labor and remaining material to efficiently construct the ship. Work will be performed in Pascagoula, Miss. (82 percent), Crozet, Va. (4 percent), Beloit, Wis. (2 percent), and New Orleans, La. (1 percent), with other efforts performed at various sites throughout the United States (11 percent). Work is expected to be completed by June 2017. Contract funds will not expire at the end of the current fiscal year. This contract was awarded on a sole-source basis and was not competitively procured. PASCAGOULA, Miss. 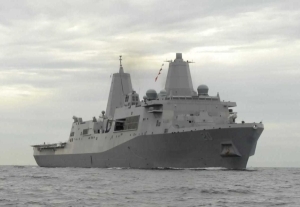 --- The U.S. Navy today awarded Huntington Ingalls Industries (HII) a $1.5 billion fixed-price incentive contract for the detail design and construction of the amphibious transport dock LPD 27. The ship will be built at the company's Ingalls Shipbuilding division.